I wrote about my new trainee Sae. She has proven to be hard working and reliable. She wakes up early to clean the geisha house and to sew the collars that we need to regularly change on our under kimonos. She attended kimono sewing school for a while so has actively taken on the role of sewing in my geisha house. After three months she has learned a range of banquet drinking games, and is able to help at banquets. And now she is currently practicing her third serious dance piece which she learns from one of the most senior geisha in Tokyo. She has been attending drum lessons as well and can already perform the first song in the repertoire. In the old days, young trainees came into geisha houses as early as four years old, as did my own geisha mother, and were supported fully by the geisha house. My own geisha mother was a distant relative of a distinguished Asakusa geisha, but of a poor branch of the family from northern Japan. At just four years old she was put on a train for distant Tokyo to start her training as a geisha. Girls in the old days were contracted and could not leave their geisha houses until the debts incurred in the purchase of their kimono – and lesson fees and all the tools they needed to purchase to become geisha – were paid for. But that doesn’t work so well these days when young girls come in at the earliest in their late teens, and who can leave at any time they want. And most geisha houses these days are not large establishments where there are scores of young geisha, and one runaway would not be missed, but are in houses, like mine, with one, two, or just a couple of trainees. In the old days, geisha facing their debut and all the expenses associated with that very solemn ritual at the start of their geisha life, might have had a “danna”, a sponsor who financed all the expenses of the debut, and who may or may not have had a romantic interest in the debuting geisha. Needless to say, the geisha world these days is dramatically different to former times and the burden of financing geisha debuts often falls upon the geisha house or on the geisha training and on her family. In my own case, I trained in a very conservative district where it took a whole year of training before I could go to my first day of work, and I was in a staggering amount of debt when I debuted. I would arrive at the geisha house and my geisha mother would say “I just had a set of undergarments made for the day of your debut, and I have put $1000 on your debt account”. As I was choking, she would fix me with a stern eye and say, “You do want to be a geisha, don’t you? 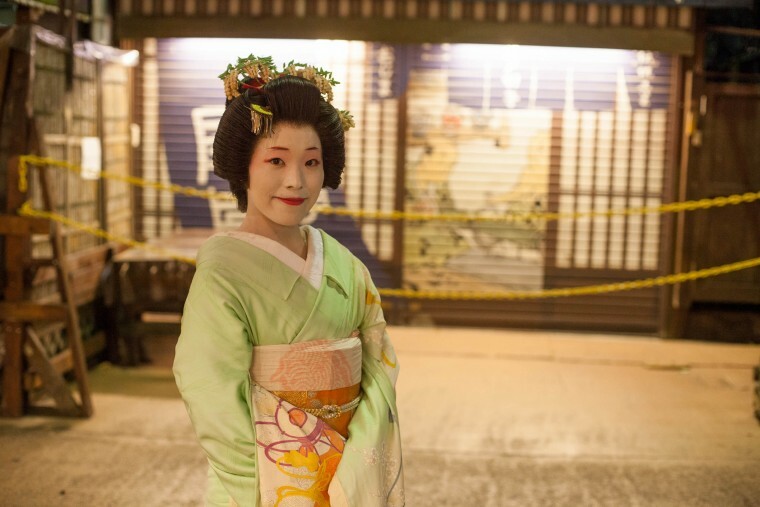 Not just any geisha, but an Asakusa geisha?” I had a very strong incentive and desire to become a geisha, but most girls these days, and their families, do not want to incur debt before they can even start work. I have been lecturing part-time at university since I became a geisha which gives me a little extra income beyond and above my income as a geisha. When I first started teaching at university I used to joke that Keio University was my danna. But more seriously, most geisha cannot lecture at university as I did, and it takes a long time in training before a geisha can teach dance or music for extra income as many of the senior geisha do. And of course geisha trainees have no income like this in the crucial period before their debuts. One of the real problems of the geisha world today is that there is nothing to take the place of a sponsor to finance the early days of a geisha career when the expenses are enormous and there is not yet enough work coming in to pay for those expenses. In the sumo world, many sumo wrestlers are sponsored by companies, and even appear on television commercials. But in the secretive geisha world that has not happened. One of my dreams is to have a company sponsor one of my trainees, paying for her financial support in the first year before they are able to properly support themselves. Such a sponsor would pay a certain amount of money each month in support, and perhaps could even be paid back in banquet attendances after the young geisha gets through her first year, for example. If there are any companies out there reading this, do keep this in mind! But perhaps there are also other ways to do things in the digital age. A girl recently wrote to me on the net asking if she could be of help to my geisha house. I am deeply grateful to even be asked this. It is so nice to know that people are interested in geisha and what I am doing and in helping to protect geisha culture. I wonder if some of the fans of forums about geisha might not be able to collectively sponsor the training of a young geisha. In return she could write a blog, update them about her daily life, or post photos. Or even meet them if they travelled to Japan. In my career as a geisha, I have tried many new things – initially always with the permission of my geisha mother and the geisha office – aimed at trying to ensure that geisha culture survives the modern era. But I have not yet solved the dilemma of how to help young geisha through the crucial first year of training. It will take another six or nine months for Sae to become competent enough to be more than a trainee at banquets attended by older geisha from whom she must learn. How wonderful it would be if we could find new sources of support for new geisha – like a group of geisha supporters around the world, connected by the internet – helping to sponsor a young girl and help her on her way to achieving her dream of becoming a geisha.